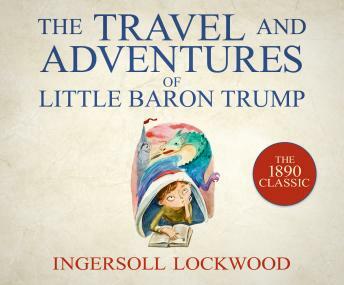 Ingersoll Lockwood invented the fictional character Baron Trump in 1890 for a two-part sci-fi/fantasy series about a privileged German heir who undertakes a sequence of fantastic voyages. The style of the Baron Trump series-a mix of fantasy and young-reader-oriented science fiction-anticipated and may have influenced L. Frank Baum's Oz series. The Travel and Adventures of Little Baron Trump describes Baron's trip around the world with his little dog Bulger, meeting new races like the Wind Eaters, Man Hoppers, Round Bodies, and Melodious Sneezers, in as yet undiscovered lands. The unusual prescience of Ingersoll's narrative has given rise to a conspiracy theory that U.S. President Donald Trump has had access to a time machine.